If you have been looking for a way to greatly increase the daylight intake at your property, then you have found the perfect product in the Duratech Fixed Flat Glass Rooflight. This high quality roof light comes with a 6-millimetre outer pane and an 6.4-millimetre laminated inner pane. Duratech Flat Glass Rooflights are for fixing direct to a fully finished builders upstand (50mm minimum width) Double glazed units to be 6:16:6.4. Inner pane to be laminated. Black finish to glass border. Extruded Aluminium frame to be polyester powder coated grey. A Duratech Fixed Flat Glass Rooflight is practically maintenance free which makes it a very convenient choice on top of all the other beneficial features when it comes to light intake. You will only need to carry out an occasional aesthetic cleaning, there is no maintenance schedule to adhere to. 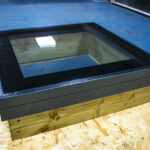 The Duratech Fixed Flat Glass Rooflight will be easy to install and maintain. When it comes to efficient and cost effective ways to allow more daylight into your home, it doesn’t get any better than a Duratech Fixed Flat Glass Rooflight. You will be amazed at what a difference the newfound level of light will make – your home will truly be transformed in ways you never thought possible. As a company, Duratech has quickly made its way to the list of top suppliers when it comes to roof windows and lights. The high quality source materials, superbly creative product designs and unparalleled levels of manufacturing expertise make them a company you know you can trust. You can buy with confidence knowing that a Duratech Fixed Flat Glass Rooflight will adhere to building regulations and greatly increase your property’s thermal efficiency.